When you want to snuggle the Himalayas to its best, north Sikkim can be your best bet. The astounding view of Kanchendzonga, the aroma of plentiful hilly flowers, a serenity of the lakes and sparkling of Teesta have made North Sikkim the most sought after destination that no true traveller wants to miss. So whether you look for serenity or adventure or romance – North Sikkim is the perfect destination that you must visit at least once during your lifetime. Well, this may not be possible to visit every nook and corner of this part of the Sikkim. But you shouldn’t miss any of the places mentioned below. Lachung – Situated on both banks of the swift Lachung River, this small Himalayan village could be the perfect destination for any nature lover. Tranquil, stunning and amazing – Lachung offers everything an avid tourist looks for. The village is located near Tibet border. The Gompa is one of the major attractions of the place while you can also have a quick visit to the nearby Shingba Rhododendron Sanctuary. The village can be remembered for its unique culture and handicrafts. Yumthang Valley – This is another picturesque place that is known for its treasure of thick rhododendron forest and hot sulphur spring. This valley is the habitat for over 20 rare species of rhododendrons and thus the valley is named as the ‘valley of flowers’. The vast meadows, the passing of Teesta – everything makes Yumthang a paradise to the nature lovers. Any popular tour operator includes this place in their Sikkim Tour Package. Lachen – At this place, some amazing aspects come alive. There is hardly anyone who can gainsay the unexplored splendour of Sikkim. Nestled amongst lofty, often snow clad mountains, Lachen is any traveller’s dream destination. The word Lachen means Big Pass. It is the base for famed Gurudongmar Lake and Chopta Valley. The Gompa over here is a must watch. Yumthang Valley is just a two-day trek from Lachen. The best time to visit the place is during summer. This is the time when the annual yak race occurs. Thangu – This peaceful village is located on the way to Indian Military Base. This is also the base for tourists who want to trek to Muguthang and Chopta Valley. This scenic Himalayan hamlet has a very scanty population making it the perfect destination for the true travellers. Green Lake Trek– This alpine lake, the base camp of Mt. Kanchendzonga, is located at a height of nearly 5000m. Green Lake is situated in a close proximity to Zemu glacier and this amazing location has made it just perfect for a daring trek. The trekking trail of the waterbody passes through primulas, rhododendron, and blue poppy forests. Tour operators usually include this place to their North Sikkim tour package, on request. 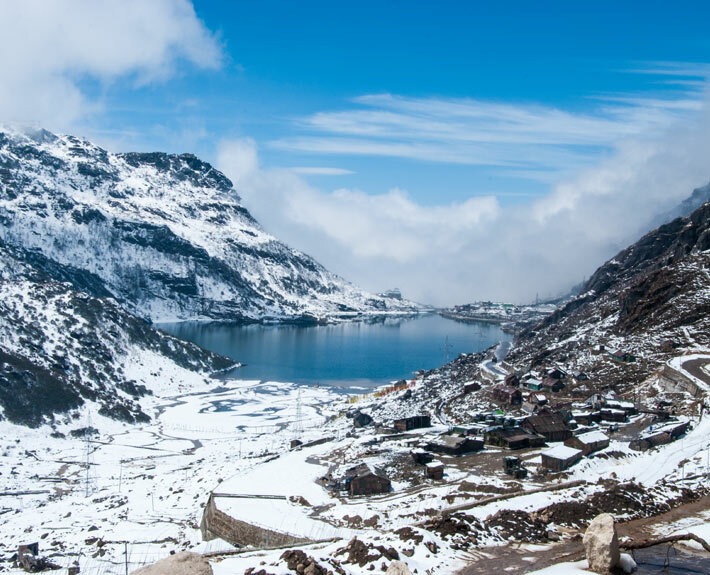 These are just a few places that you must not miss to visit during your trip to North Sikkim.